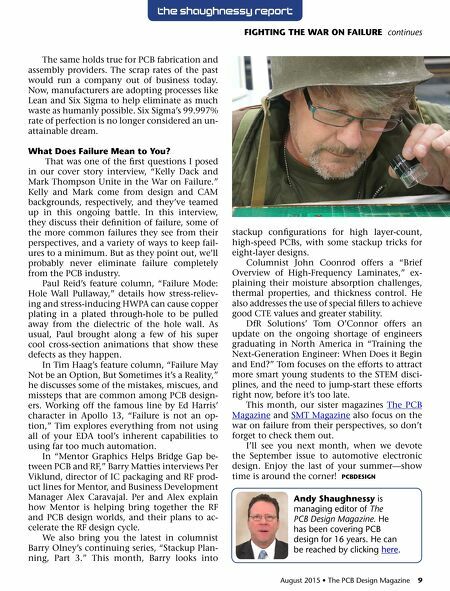 8 The PCB Design Magazine • August 2015 by Andy Shaughnessy i-ConneCT007 THE SHAUGHNESSy REPORT Fighting the War on Failure column In this issue, we focus on the "War on Fail- ure," a war that your company is likely already prosecuting. The big question is this: Can we ever win this war? 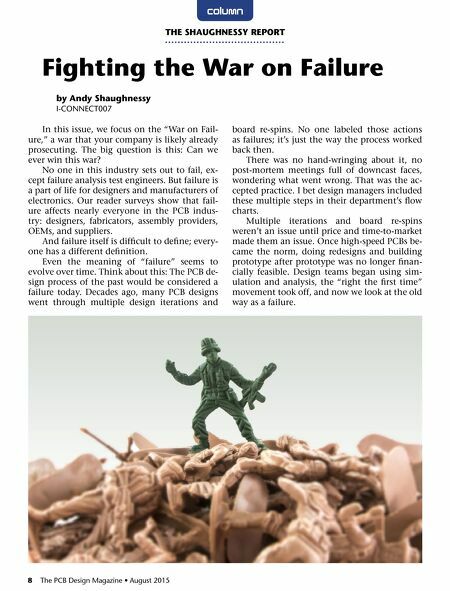 No one in this industry sets out to fail, ex- cept failure analysis test engineers. But failure is a part of life for designers and manufacturers of electronics. Our reader surveys show that fail- ure affects nearly everyone in the PCB indus- try: designers, fabricators, assembly providers, OEMs, and suppliers. And failure itself is difficult to define; every- one has a different definition. Even the meaning of "failure" seems to evolve over time. Think about this: The PCB de- sign process of the past would be considered a failure today. Decades ago, many PCB designs went through multiple design iterations and board re-spins. No one labeled those actions as failures; it's just the way the process worked back then. There was no hand-wringing about it, no post-mortem meetings full of downcast faces, wondering what went wrong. That was the ac- cepted practice. I bet design managers included these multiple steps in their department's flow charts. Multiple iterations and board re-spins weren't an issue until price and time-to-market made them an issue. Once high-speed PCBs be- came the norm, doing redesigns and building prototype after prototype was no longer finan- cially feasible. Design teams began using sim- ulation and analysis, the "right the first time" movement took off, and now we look at the old way as a failure.